Meet Brisbane’s BEST Mobile Mechanics of 2018! That’s why today, we’re here to recognise the Top Mobile Mechanics in Brisbane. In 2018, AutoGuru partner mechanics in Brisbane quoted over $7 million worth of services and repairs for AutoGuru customers, to help them better care for their cars. We’re here to recognise the Top Mobile Mechanics in Brisbane, who went above and beyond to consistently deliver amazing service experiences to their customers. Taking the top spot is Stouch Auto and Mechanical Mobile! With more than 30 years combined experience, the team, headed up by Muda Tonhodzayi, are highly trained diagnostic technicians who are capable of carrying out a wide range of jobs. They’ve got you covered for everything from basic and logbook services, to auto-electrical and air conditioning jobs, all with a service that’s tailored to your needs. 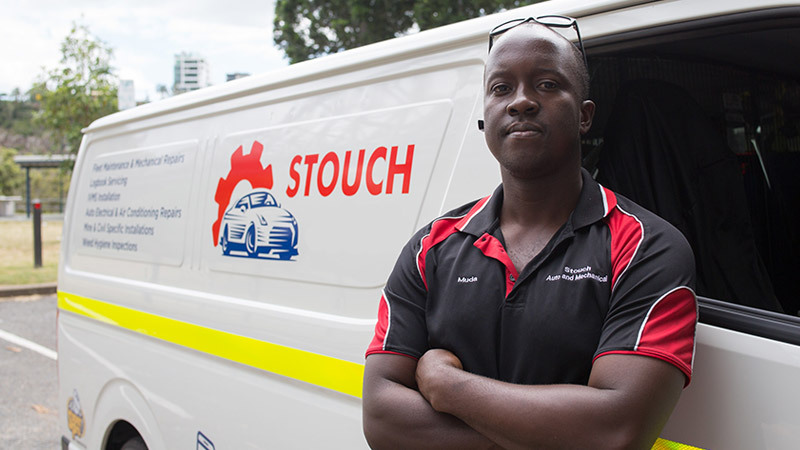 With an awesome 4.8 average star rating, we know that Stouch Auto and Mechanical Mobile are well deserving of the top spot as Brisbane’s Best Mobile Mechanic. Woody’s Mobile Mechanic has been in operation for 16 years, and they know their stuff! Brian Woodroffe (aka Woody) is the man in charge, and realises how important it is to provide convenience to his customers. He can complete all types of mobile mechanical work, with all of it being guaranteed too, such as logbook servicing. Woody prides himself on obtaining considerable experience on both old and new vehicles, and using the latest diagnostic equipment as well as high quality oil and parts. Take a look at this 5-star review for Woody’s Mobile Mechanic. Nick Klinkenberg and the team at Fix My Car Brisbane realise how inconvenient getting your car serviced or repaired can be, and they want to make it as hassle free as possible. Fix My Car Brisbane can do everything from oil changes to engine repairs, without you even having to leave the home or office. The team has achieved a 4.9 average star rating on AutoGuru, and believe that quality car repairs and servicing aren’t reliant on location.. It can be done anywhere! Fix My Car Brisbane has a passion for quality service, and they can’t wait to share it with you! Check out one of their awesome reviews. The team at Carworx Automotive Services has over 41 years of experience, and is ready to service your vehicle with all the latest equipment on hand. They’ll have you covered for everything from mechanical servicing, repairs, maintenance, roadworthies and much, much more. Carworx Automotive Services provides a fully equipped, fully qualified and value for money mechanical services to customers. Their goal is to be high quality, fast and efficient, all without interrupting your schedule. Have a look at this great review for Carworx Automotive Services. Rounding out our Top 5 Mobile Mechanics in Brisbane is Rollin’ Mechanical. Baxter from Rollin’ Mechanical will cater for all your vehicle’s needs without you having to leave the house. They also have the added value of a workshop in case larger jobs need to completed. He prides himself in keeping your car 100%, without the hassle! Sounds like a good deal to us, and his reviews definitely agree, considering Rollin’ Mechanical has maintained an awesome 4.9 average star rating. Check out one of his 5-star reviews below! Looking for a mobile mechanic in Brisbane?